The gluteals are comprised of 3 muscles at the posterolateral aspect of the hip. These muscles include the gluteus maximus, gluteus medius, and gluteus minimus. Due to their location and connection between the pelvis, sacrum, and femur, they function in hip extension, abduction, external rotation, and internal rotation. But, they are also important from a stabilization standpoint, as they prevent hip internal rotation and help to align the lower limb during single leg stance and running. I bet, at one time or another, you have heard how important these muscles are for everyday movements, athletics, and running. But, have you ever performed any type of assessment to truly test their integrity? If not, I have a very simple self-assessment that you can complete in 60-seconds or less. It’s called the hip bridge with straight leg raise. Because the gluteals play a variety of roles around the hip, this self-assessment could have shown you poor stabilization, hamstring dominance, poor neuromuscular control, gluteal weakness, or all of the above. Once you have improved the weak link(s), the next step is to build overall strength, stability, and endurance with a structured and progressive lifting program. This area can never be too strong and resilient! If you found any issues with the self-assessment outlined in today’s article, I highly recommend reaching out to a knowledgeable healthcare professional who can help you create an action plan to see reliable results. Please click here to contact me directly if you have questions or want to work more closely together to find a solution. The gluteals are some seriously important muscles in the posterior/lateral hip. Not only do they function to provide stability in the frontal plane during single leg stance, but the gluteus maximus is the main contributor to hip extension and propelling the body forward in gait and running (see left leg below on the push-off). Just below the gluteals is the hamstring muscle group. During hip extension the hamstrings function as synergists, which mean they assist the gluteals to create movement. Assist is the key word, as the gluteals provide the biggest impact with some hamstring assistance. However, on a daily basis I evaluate people with varying degrees of gluteal inhibition. Don’t confuse this with gluteal weakness as it’s more of a neuromuscular limitation than an actual muscular weakness. In a way, this is actually a good thing since we can provide the appropriate stimulus which will restore the connection. Weakness in a muscle can take weeks or even months to improve. When gluteal inhibition is present, the risk of injury at the back and lower extremity rises. Not to mention higher levels of stress through the hamstring. As mentioned above, gluteal inhibition will lead to more reliance on the hamstring group. Unfortunately, the hamstrings are not the best back-up which leads to the development of muscular tension. This tension can lead to chronic tightness, tendonopathy, and strains. Now that you have completed the self-assessment, did you notice an inability to extend the hips, difficulty keeping the pelvis level, or cramping in the hamstrings? If so, implementing a strategy to improve gluteal inhibition is key. There are a myriad of activation exercises that can be used to restore function and success often differs between people. But, one in particular always rises above the others and has been the best strategy for my clients. Again, it’s focus is neuromuscular in nature and not to strengthen this muscle group. In the following video, you’ll find an activation exercise that incorporates shoulder internal rotation to stimulate the back functional fascial line in which the latissimus dorsi and gluteus maximus are part of. This firing elsewhere along the fascial line seems to improve activation of the gluteals in subsequent movements and when re-tested. I was fortunate enough to learn this from Dr. Craig Liebenson at a Perform Better Summit several years ago. Once the connection is improved/restored, exercises to further enhance function should be completed. Two of my favorites that commonly yield success are the forearm hip extension and cook hip lift. These need to be done before further gluteal strengthening can be carried out. After reading this article I hope you have a deeper insight on how your body is functioning. Also, the knowledge to determine the difference between gluteal inhibition and weakness. If inhibition is the true underlying issue, the above mentioned interventions will yield at least some success to complete resolution. But on the other hand, a weak gluteus maximus will remain weak despite working on activation until weeks of strengthening are completed. 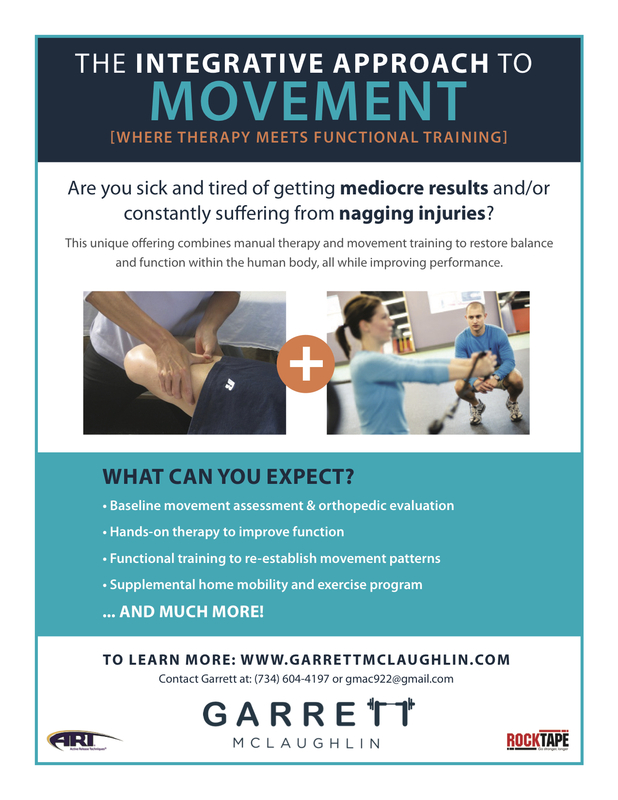 If you live in the Nashville area and want to learn more about neuromuscular activation relating to the hips, please consider attending my upcoming seminar on Saturday, March 25th. Chris Wolfe and myself will be hosting, ‘Take Control Through Balance & Coordination.’ This seminar will touch on the basics behind hip activation with strategies to apply immediately within your program to see results. It will also serve as a great self-assessment for you to gain better insight on how your body functions. Recently, I have had the conversation with several of my clients on the topic of tightness. Where I think most are going wrong is defining tightness and their intervention to it. Just because we feel “tight,” doesn’t mean we have to stretch. In some situations it may actually exacerbate the problem. With “tightness” being so subjective, we often fall victim to stretching every single time with little to no resolution in the symptom. Essentially that is what it is, a symptom not the actual problem. After completing the self-assessment, the inability of the knee to extend within 30 degrees of full extension is a positive finding determining you have a shortened (“tight”) hamstring. A negative test means your symptoms are subjective and there may be something else that is causing this feeling. Negative tests are the ones where looking for the root cause needs to be investigated. The origin can vary and may include pelvic malalignment, fascial restriction, lack of gluteal activation, and even hamstring weakness. Stretching in these cases can exacerbate your symptoms, rather than solve the problem. Luckily I created videos to help you investigate further. For years, we have recommended stretching when tightness is present. The issue that arises is that tightness can be a feeling and not a true objective measure. When that’s the case, stretching can further exacerbate the problem and be far from a successful intervention. My hope is that this post allows you to dig deeper into your hamstring tightness and saves countless hours spent stretching.